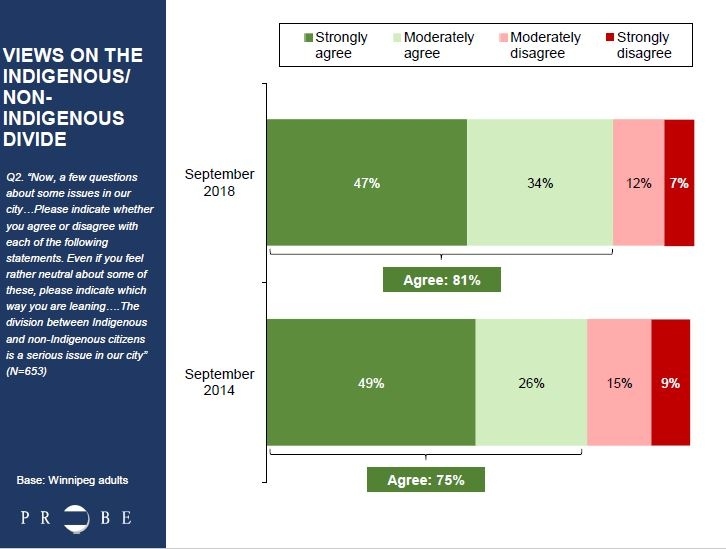 Over 80 per cent of Winnipeggers believe the divide between Indigenous and non-Indigenous citizens is a serious issue in the city, a number that has increased since the last civic election, according to a new poll. 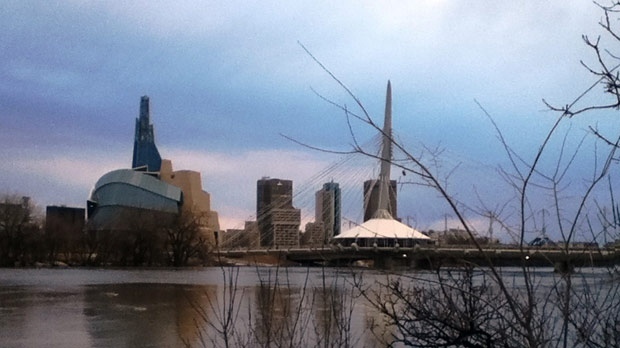 “Winnipeg has a large Indigenous population, growing Indigenous population, and it is socioeconomically, politically, kind of isolated from the rest of the city. The sense of shared community needs to be built upon for sure,” said Jacqueline Romanow, chair of Indigenous studies at the University of Winnipeg. Probe Research collaborated with CTV Winnipeg and the Winnipeg Free Press to ask 653 Winnipeg adults between Sept. 19 and Sept. 28 whether they believe the divide is a problem. The survey’s findings suggest residents of all demographics overwhelmingly agree that it continues to be an issue. 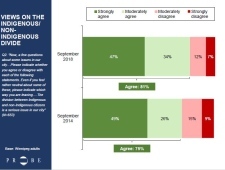 In fact, the number of people who feel the split is problematic has risen six per cent since this question was last asked during the 2014 civic election. “I think there’s issues with internalized racism, discrimination, misunderstanding, mistrust. All of these things really make it hard to develop a shared sense, of whether it’s civic identity and shared goals,” said Romanow. 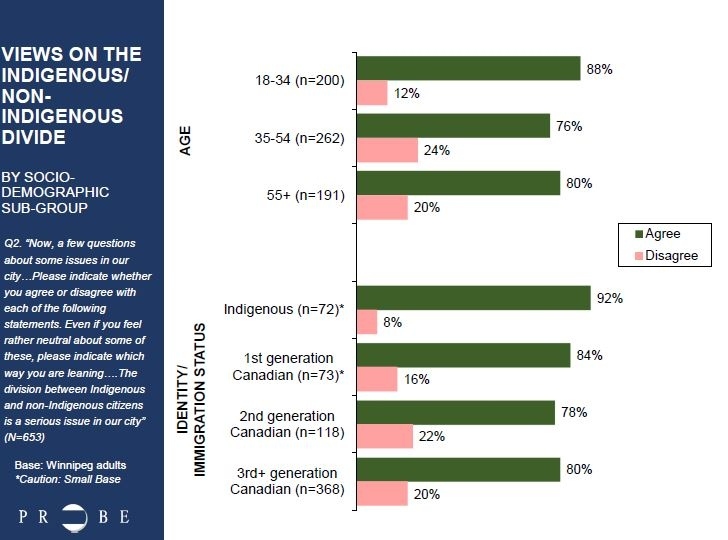 When the survey respondents are broken down into demographic categories it shows that first generation Canadians and Indigenous people strongly agree with the sentiment, at 84 per cent and 92 per cent respectively, though the survey cautions only a small base size of these demographics were polled so the numbers may not be conclusive. “For Indigenous people if you’re looking at socioeconomic inequities, obviously you’re concerned, well you can’t just overcome this by saying ‘Okay, now we’re going to be friends.’ Because you’ve got 150 years of mistrust that’s built up, of things that have gone wrong in the relationship,” said Romanow. The research also found that 88 per cent of Winnipeggers age 18 to 34 agree the divide is an issue and 75 per cent of residents above the age of 35 believe it to be true as well. When it comes down to the candidates in the mayoral election, it’s supporters of Brian Bowman, the city’s first Métis mayor, who are most likely to hold the belief. The majority of people (90 per cent) who plan to vote for Bowman agree with the sentiment, while only 66 per cent of Motkaluk supporters see the divide as an issue. 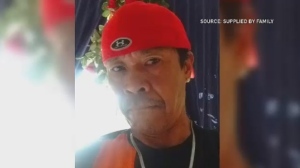 For his part, Bowman says he's placed a lot of attention on building bridges between the Indigenous and non-Indigenous community during his first term in office. He points to the creation of the Indigenous advisory council, which helped guide the development of the indigenous accord signed in 2017. "There's been a number of not just ceremonial activities at the city of Winnipeg, but real substantive efforts including mandatory reconciliation training for our roughly 10,000 employees," Bowman said. Still, Bowman says there is a lot more that needs to be done. In that, challenger Jenny Motkaluk agrees. "At the very least we need to break down the barriers that exist," said Motkaluk. "We need to acknowledge we have systemic barriers that indigenous Winnipeggers face that the rest of us don't." “If Winnipeg is going to be a vibrant, successful economy in the future, we have to integrate the Indigenous population and tap into all of that human potential, in terms of ideas, in terms of labour, in terms of even political engagement,” said Romanow. The city’s municipal election is taking place on Oct. 24. Winnipeg skyline. Photo by Zerlina Mink.